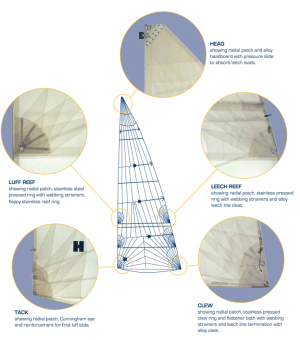 There are two alternative genoas - A cross cut sail from high quality, densely woven Dacron and a tri-radial sail cut from polyester cruising laminate. The Dacron sail is more durable and easier to maintain, the laminate holds its shape better in strong winds and is likely to give a better performance. HEAD - Webbing loop, reinforced internally with leather to withstand wear from halliard. 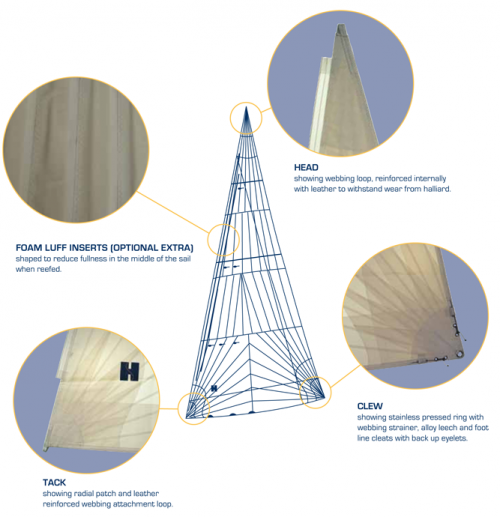 FOAM LUFF INSERTS (OPTIONAL EXTRA) - Shaped to reduce fullness in the middle of the sail when reefed. CLEW - stainless pressed ring with webbing strainer, alloy leech line cleat with back up eyelets.